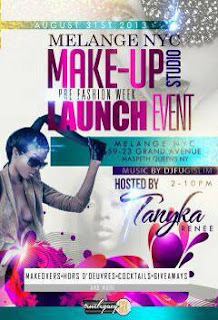 Melange NYC, a new, upscale makeup studio located at 59-23 Grande Avenue in Maspeth, Queens will host its launch event on August 31st from 2-10pm. Melange NYC is the brainchild of celebrity makeup artists Eve Chen and Ketta Vaughn, founder of Ketta Vaughn Cosmetics. Melange NYC is a full service makeup studio that will offer a professional, customized makeover experience to all who enter the space as well as beauty seminars, lessons, and makeup parties for their clientele. Ketta Vaughn is a line designed with you in mind, developed and tailored from the perspective of a seasoned makeup artist. Therefore the line embodies everything you need for an everyday, casual look to the intense color range and supplies entertainers and makeup artists need. Always working with a very diverse clientele, Ketta always enters each beauty commitment with a fresh, open-minded approach to enhance creative flow and achieve the target look. She is a fashion foward, innovative, multi-faceted artist that has acquired a reputation as flawless as her make-up application. ​From a casual everyday look, to a 9-5 look, to Red Carpets, to girls night out, to a hot date, to bridal suites, to backstage fashion show mania, to photo shoots, or to be simply glam for any event, Ketta Vaughn provides a color range to create any look. Ketta Vaughn is a lifestyle beauty brand, dedicated to empowering and inspiring through creating iconic beauty. Have an experience that will perfectly transform your look and attitude. Ketta Vaughn continuously explores and implements current beauty industry and lifestyle trends to compliment your personal style and/or the projects' visual requirements. Escape into a fantasy playground of shades to be explored! ​ Ketta Vaughn products are never tested on animals.